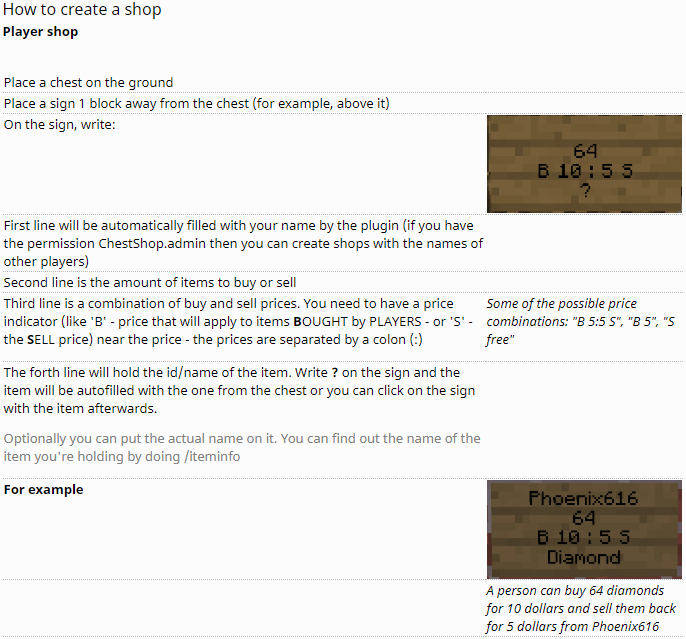 On MCAU we use the ChestShop plugin allowing standard users to create their own buy and sell shops. We also have a custom script allowing the purchasing of teleports to said shops, but there is no video tutorial for this. What rank must I be to create a shop? What is the command for the shop teleports script? Can I view shop teleports? The first command displays shops in descending order of popularity. The second command displays random shops. So how to I teleport to a shop? How do I purchase a shop? Number is to be a whole number between 1 and 9999, and no one else can already own that number. How do I add money to my shop’s balance? Number is your shop number, and Amount is the amount of dollars you wish to deposit. Can I add display what I sell? Number is your shop number, and Category is the the subsection you wish to apply to your shop, leave blank to view all possible categories. Can I delete my shop? This will permanently delete your shop, and no refunds are allotted for any money left in the account. If you accidentally purchased the shop, create a /modreq instead. Why do you need the golden axe? cant you just use a normal one?